You guys know I love simple. 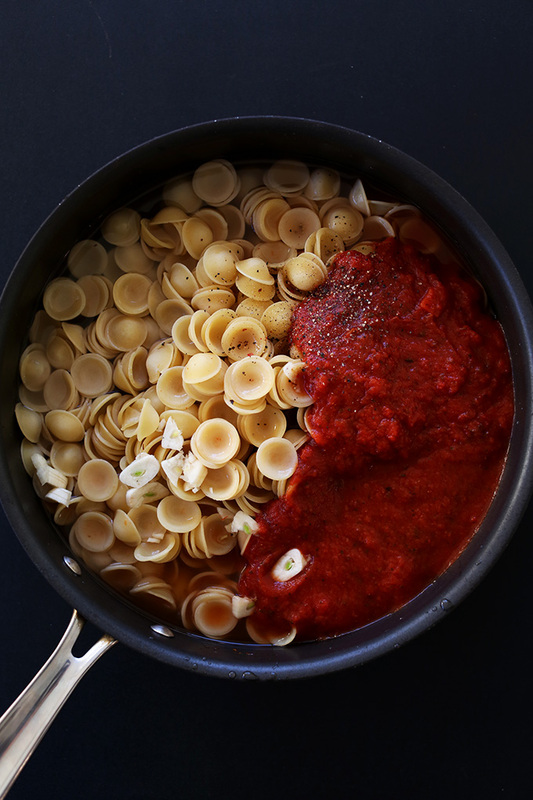 Well it doesn’t get any simpler than this: 1-pot pasta. Yep, all the ingredients in ONE POT. I think I’m in love. I’m not sure where this idea originated – probably Martha Stewart herself. But I love it. Not that pasta is super complicated anyway, but to create an even smaller mess and save time is a double upgrade if you ask me. 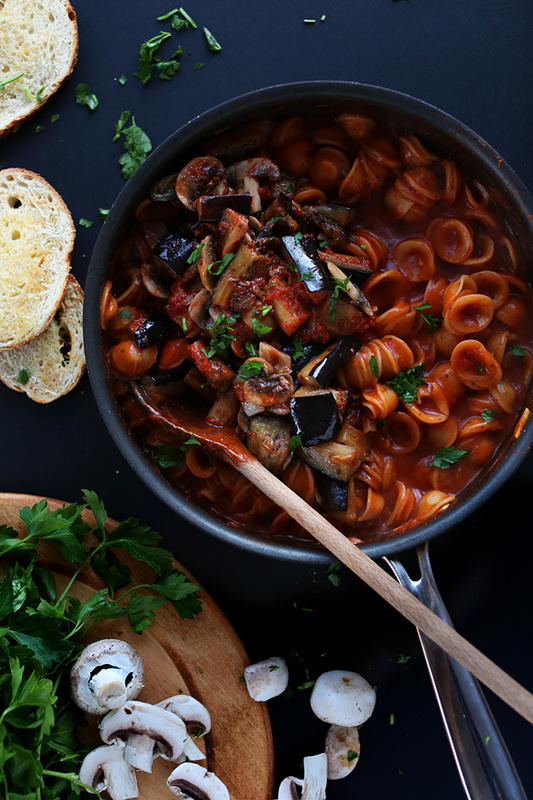 This dish starts with plenty of veggies: Mushrooms, eggplant and fresh parsley. You start by sauteeing your veggies in a big pot or pan and then setting them aside. Next comes the pasta, tomato sauce, garlic, water and seasonings into the SAME POT. Super easy stuff. Then you literally just bring it to a boil, cover it, and let it simmer until the noodles are al dente. All that’s left to do is taste, adjust seasonings, and throw the veggies back on. So simple. So good. Plus, it’s extremely customizable. Use your pasta of choice, sub in your favorite veggies, throw in fresh herbs, roast your garlic, top with cheese – the options are endless. Enjoy! 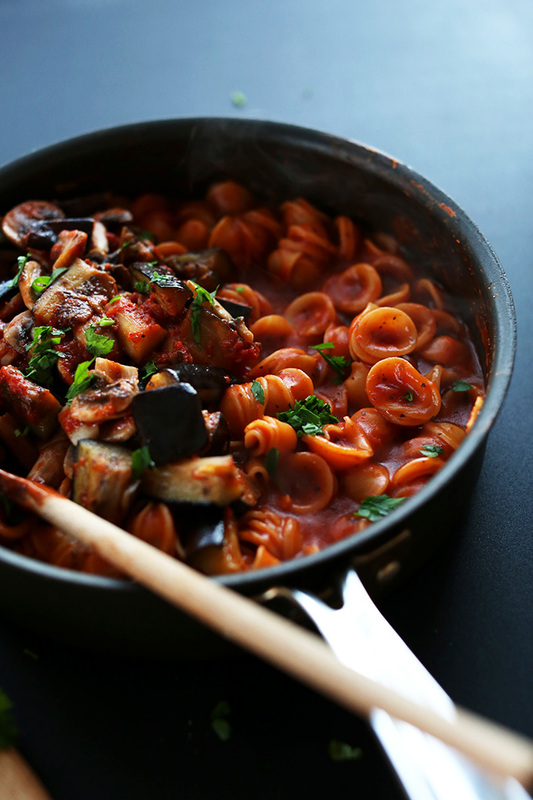 Healthy 1-pot vegan pasta with sauteed mushrooms and eggplant. Easy, customizable, and super delicious. Rinse and dice eggplant into small, bite-sized cubes. Place in a colander in the sink and sprinkle generously with salt to draw out some of the moisture. Wait 20-30 minutes. Then rinse and pat thoroughly dry with a towel. Set aside. 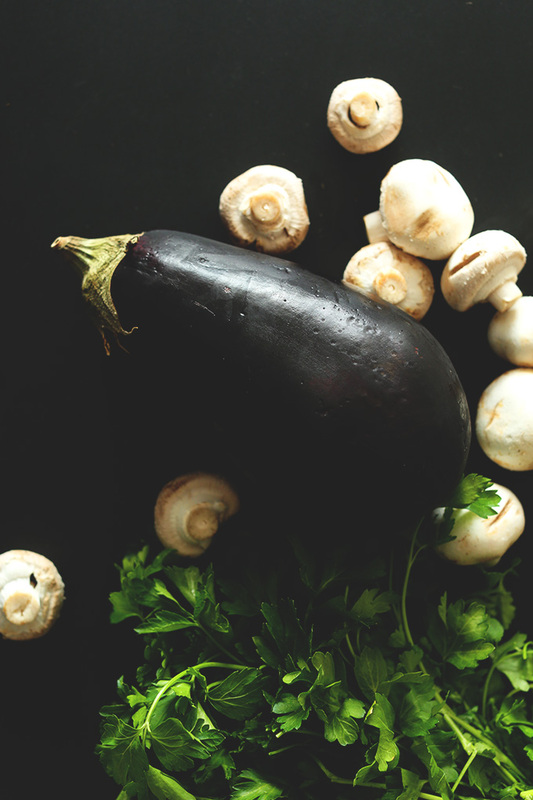 If you’re short on time, skip the eggplant and double the mushrooms. Heat a large saucepan over medium-high heat. Add olive oil, the eggplant and 1/3 of the minced garlic (1 clove as original recipe is written // adjust if altering batch size). Sprinkle with 1/2 tsp sea salt (as original recipe is written // adjust if altering batch size). Sauté for 3-5 minutes or until a golden brown color is achieved, then add the mushrooms and cook for 2 minutes more or until all of the veggies have color. Set aside and cover – you will top the pasta with it. To the same saucepan, add the pasta, water, marinara sauce, the remaining cloves of garlic. Start with 1.5 tsp sea salt and 1 tsp black pepper (you will likely add more later depending on the saltiness of your marinara/your personal taste // amount as original recipe is written // adjust if altering batch size). Bring mixture to a boil, then cover and reduce heat to a simmer until the pasta is cooked to al dente – will vary depending on kind of pasta – but typically an average of 10 minutes, stirring once or twice so it doesn’t stick to the pan. Once cooked, stir and taste to adjust seasonings. I added more salt and fresh herbs at this point. Remove from heat and top with eggplant-mushroom mixture and more fresh parsley or basil. Serve immediately. Serves 3-4 (as original recipe is written). *For the pasta, I used 3/4 of a 16-ounce bag of orecchiette, but I would recommend a spaghetti or penne, as it’s not as likely to clump together. *Use gluten-free pasta to keep gluten-free. I’ve been making this recipe for a while and it never disappoints! I find rotini works really well with this recipe so I usually use that. I also use the entire eggplant and more mushrooms just to give it more veggies. Thanks for the great recipe! Very tasty dish. I loved this since it was so easy and what favor! Next time I am going to use my edamame pasta with it. YUM! Hi Looks soo amazing and i tried making and it tasted good! but would you go metric measurements too, or just convert it? It would save a lot of people a lot of time like me because i love all your recipes! I have made this a number of times. It is a favorite, but the amount of salt called for is way high. I used 1/4 tsp with the eggplant and mushrooms, and 1/2 tsp in the sauce and pasta. The recipe called for 1/2 tsp and 1 1/2tsp. My reduced salt version still turned out a bit salty. So …I made this! The taste was awesome. I did as you suggested, and used spaghetti instead of Orechiette. I also added chopped spinach at the end, to incorporate some greens. My one disappointment: it was “sticky”. The cooking process caused the pasta to be very sticky as a result of too much starch. While I like the one-pot idea, I think next time I will just boil the pasta in water, and add the ingredients together at the end. Excellent recipe for a tasty pasta, despite the starch issue! I will make this again! I used protein penne pasta and a fire roasted tomato pasta sauce. Super yummy! Thank you for the recipe. Just tried this and had a lot of trouble with liquid to pasta ratio, I used 11.5 oz fettucini noodles, not sure if I woulda have success with smaller pasta, but I started with the liquid called for and it was nowhere near enough, I kept having to add more and added more pasta sauce, water, and some milk to make it nice and creamy (I know that de-veganizes it, I’m not vegan). Because I kept having to doctor it it took awhile for the noodles to fully cook and some got stuck on at the bottom. It tastes good but I probably wouldn’t make this again, feel like it woulda been less hassle to just cook pasta and sauce separately. This Dish is more than 100 years old its not Martha Stewarts its a Mediterranean dish versions of the dish can be found in Italy, Greece, and parts of the Mild east. I think people should do more research on deferent diets and have a better understanding ! like imam baildi which is served with couscous or cracked barley an other dish is Melanzane parmigiana ok you are vegan don’t add the cheese or add the fake one with the yeast or try the greek way with orzo also try it with pasta al fourno which means in the oven: slice everything thinly add a bit of olive oil or avocado oil, thyme, oregano black peper and a bit of garlic when all veggies are soft add tomato with a dash of balsamico mixed together then add the pasta mix them well and leave them in the oven util the tomato is dense and the pasta is cooked this is one oven tray instead of one pot and you get to slow cook all the ingredients bon appetit! my question why do you use parsley there are so many nice herbs out there? Super easy & delicious! Had a lot of flavor which was surprising. I used penne which I enjoyed with it. Upped the mushrooms a bit. Will definitely put into regular rotation. It was delicious, but the pasta (I used penne) took sooo long to cook. Definitely going to cook the pasta separately when I do this again, to save some time! Just made this! Very versatile, and my dad also liked it. I had seconds. Thanks a lot for posting this recipe! Great recipe! Turned out very delicious, to spice it up I added some red chilli powder. Just made it. Added onion and parmesan cheese on finished pasta. It is amazing! We are enjoying it as we speak. My husband thinks it’s great and I loved that it was not hard to make. I used Trader Joe’s Red Lentil Pasta and kept it al dente. I used fresh rosemary and parsley, dried oregano, and chile flakes. I also made almond/lemon zest vegan parm to put on top. It did not take too long to sweat the eggplant. I was concerned about that, but it was simple. I soaked the almonds before making the parm and removed the skins. I’d love to make this for a family gathering – does it store well? If I make it the day before would that work? Hmm, it’s best when fresh but should reheat OK the next day. oh my gosh yes please to everyone of these gorgeous dishes! And love the little slide bar to go to the next recipe, so smooth! Genius. Pinned and can’t wait to make my dinner life easier and healthier with these. 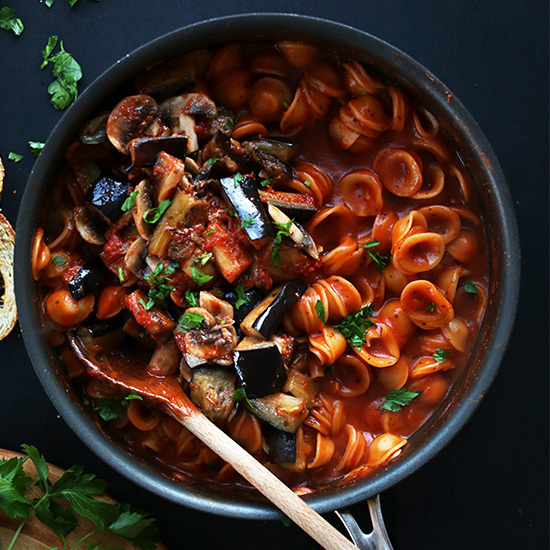 I love your recipes and am cooking this one right now, but if you have to use a colander and a bowl to set aside the eggplant while the pasta is cooking, it is no longer a one pot meal. You tricked me! Made this recipe last night, added some zucchini with the eggplant and mushrooms. This was INCREDIBLE! Definitely one we will be making again! I made this recently and it was a total success! I altered a few things, I cooked the pasta separately and used fresh instead of dry orecchiette (didn’t clump together at all), added peperoncino (chili powder), and didn’t bother to draw out moisture of the aubergine as I didn’t think it was necessary. Will definitely make again! Many European nations have one pots, but it’s mainly Italian. It’s so interesting how it became a big hit after Martha Stewart made it. I am gluten free and really don’t like to use gluten free pasta…. What can I use as an alternative for pasta? This looks amazing! Can’t wait to try it tonight for dinner. Would you recommend subbing some veg broth for water? You can try it, but I haven’t tested it that way! Good luck! This was great! I’m not a fan of mushrooms and I’m not sure if we are eggplant fans so for the veggies I used onion, zucchini and fresh tomato. I also used cilantro for the herb and it was a nice kick! For those up in arms about the “one pot,” I accomplished this by cooking the veggies in the pot, setting them aside on a plate when done and cooking the pasta in it, then adding them back…Really not that complicated! This is such a versatile recipe…My only gripe is leaving 1/4 of a box of pasta left…What the heck am I supposed to do that with that ? Incredibly delicious is all I can say. I honestly was surprised to be able to create so much flavour with so few ingredients. I used penne noodles, and found I needed to cook them a bit longer than 10 minutes, and I used basil instead of parsley. Fantastic flavours, and such an easy meal to prepare. We both had seconds ? – outstanding dish – very yummy. Thanks for posting! I don’t understand, If I set the pan with the cooked veggies aside, how do I cook the pasta in that pan, and then TOP it with the veggies…. I am not understanding something here…?????? Looks great! Just one thing I wasn’t sure of–did you add fresh parsley at any point during cooking or just at the end before serving. Thanks! absolutely delicious. i substituted vegetable broth for the water, used all mushrooms and penne pasta. love your website and i thank you for your lovely inspiration. Holy oh my yum. This looks fabulous. I’ve got a guy at home obsessed with all things mushroom, so I know this would be a hit! Thanks! This was sooooooo good! I left out the onion and the garlic and used garlic infused oil and it was still sooo good! Thank you for a great Vegan pasta recipe! So when cooking the pasta in water you add the sauce at the same time? so the pasta cooks in water and the sauce? This looks fabulous and SO easy :) A pot that size would make at least three meals for me, yet so simple and cheap. Have to go to my local farmers market today so will definitely be picking up ingredients for this. Thanks!! (And gorgeous photos, btw). Needed more water because I used a little more eggplant and shrooms but overall this was AMAZING. I added some vegan parmesan on top — ugh! So good!!! And so easy! Thank you! Great, thanks for sharing, Erin! This is probably a stupid question but won’t adding the water and marinara at the same time really thin out the sauce? This looks amazing and I want to try it! Just made this and I’m eating it as I type. 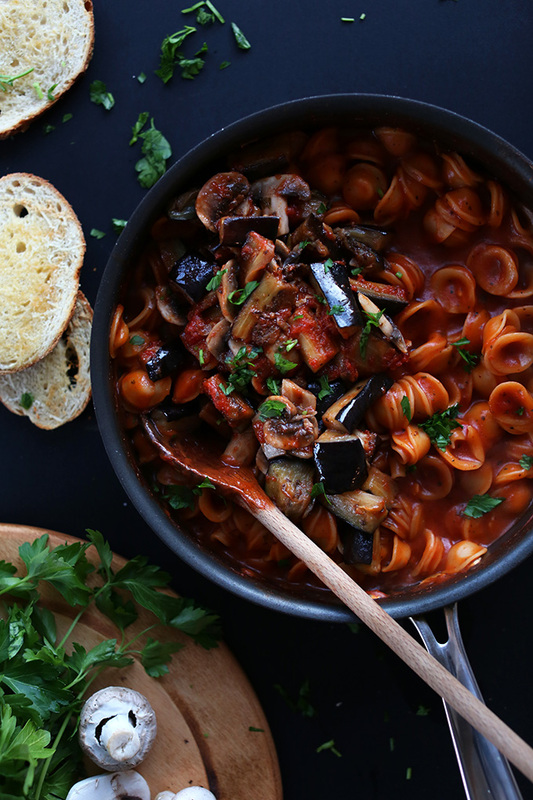 Its my first time cooking with eggplant and it is great, it adds a meaty texture to the pasta! I added green peppers and used organic corn pasta instead. Tastes awesome! It will be one of my new weekly meals, thanks so much for posting! Your sauce is very good, I advise you to use another type of pasta ? Made this for me and my guy for a quick lunch after a trip to the farmer’s market! We got an assortment of mushrooms that were all different sizes, and with the fresh eggplant it was amazing!! This dish keeps it so basic and so simple, but it comes out so flavorful! It was light yet filling, just like you said! We opted for some organic bow-tie pasta and Organic Bello’s marinara sauce. It was perfectooo! I’d definitely make this again :) thanks so much for the recipe! Lovely! So glad you both enjoyed it. Thanks for sharing! I made this for meatless Monday but changed out the eggplant and mushrooms for zucchini, onions, and tomatoes so it wasn’t quite the same recipe. However, I love the technique! So simple yet so delicious. Family members who insist on meat with every meal didn’t even care that we didn’t have meat. Definitely a keeper! Thanks! I made this last night. It was fantastic. I considering adding Parmesan (as I would to most pasta dishes), but it really didn’t need it as the recipe has so much flavor. I’ll definitely make it again. Yay! Thanks for sharing. Glad you liked it, Ginger! I made these a few days ago– made a few changes by substituting the eggplant for broccoli since neither me or the hubs are eggplant fans. I apparently didn’t read the recipe well because I cooked the pasta, mushroom sauté and marinara sauce all at the same time, and I found the pasta to burn easily so I had to turn to heat down a whole lot to fully cook the pasta. I don’t know if it burned easily because of my mistake, but after all was said and done, it was delicious and really easy to make. Thanks once again for such a wonderful, simple, healthy recipe, Dana. Oh thanks Chi! Sorry you had a few hiccups along the way but it sounds like it all turned out well in the end. Will check out the photo on Instagram! You had me at orecchiette! It’s one of my favorite pasta shapes (and the most underrated, in my opinion). This looks delicious—I can’t wait to try it! I found this on buzzfeed thanks to Facebook and was intrigued. Sadly there is no option for ‘saving’ this recipe to say Zip List, which is a bit disappointing…If you try to print it off, you get all the comments, the lot,about 26 pages including the recipe!! Please rectify this anomaly!! Keith, sorry we don’t utilize Zip list as we found most of our readers weren’t utilizing it. However, if you click the print button in the recipe box, it should print off for you on one page without the comments. Hope that helps! I’m kind of confused. 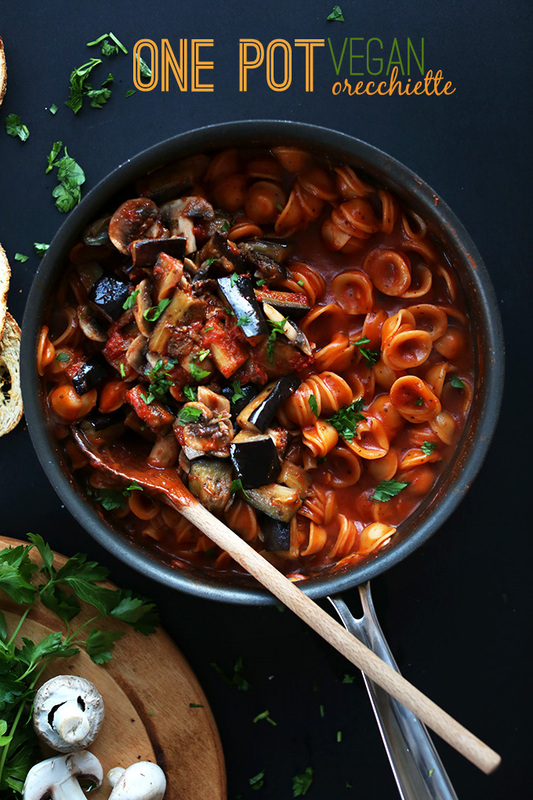 The sixth step tells us “Remove from heat and top with eggplant-mushroom mixture and more fresh parsley or basil”. Are you just saying to mix the eggplant-mushroom mixture around because it is already in the same pan? Megan, sorry for the confusion! No the veggies are cooked separately in this recipe. They’re pan sauteed and then set aside while the pasta and sauce cook. Then, they are added BACK on top of the pasta and stirred in once it’s fully cooked. Hope that helps! guess its not really one pot then, is it? It requires one pot, it has several steps. I made this last night for me and my omni partner. I used a whole small eggplant and a thick hollow noodle (can’t remember the name). Anywho, this was a HIT! She had two bowls! The noodles were great because they carried a lot of sauce and the eggplant was nice and juicy! I will be making this again! Thanks! So glad you two enjoyed it! Hi there! Is there anything I could substitute for the oil? Looks like you said Avocado but that doesn’t make sense to me for sauteeing…. but then again I’m brand new to plant-based diet :) Looks delish though!! Hi Pam, I don’t see where I recommended subbing an avocado for oil. But if you’re concerned about oil, just leave it out and saute the veggies in a non-stick pan (with non-stick spray if you can). Ah, what an awesome recipe! A pasta dish in one pot, that’s not overcooked and soggy? That is truly perfection. Thanks for sharing and inspiring! Thank you! Perfect for the vegetable loving gluten intolerant one in the relationship (me) and if I add a meatball or two on top it will be perfect for the omnivore (him) too! So glad we can reconnect, Amy! You’re the sweetest. I pulled a fast one there and switched to MB in 2012. Glad you found me again! do you have a recomendation for jarred pasta sauce? i never find one that i like…. I recommended to someone else in the comments that I usually just go for whatever’s on sale! But honestly, the local selections at your local market or store will probably be best (and freshest), so go for those first. Otherwise, look for ones with low sugar, since some can add a ton and oversweeten the sauce. Hope that helps! I have your blog on my RSS reader and when I saw the title my mind read it as “pot pasta”. I guess not too strange given all the recent talk about marijuana legislation. Anyhoo, I love all the photos especially the 2nd one. 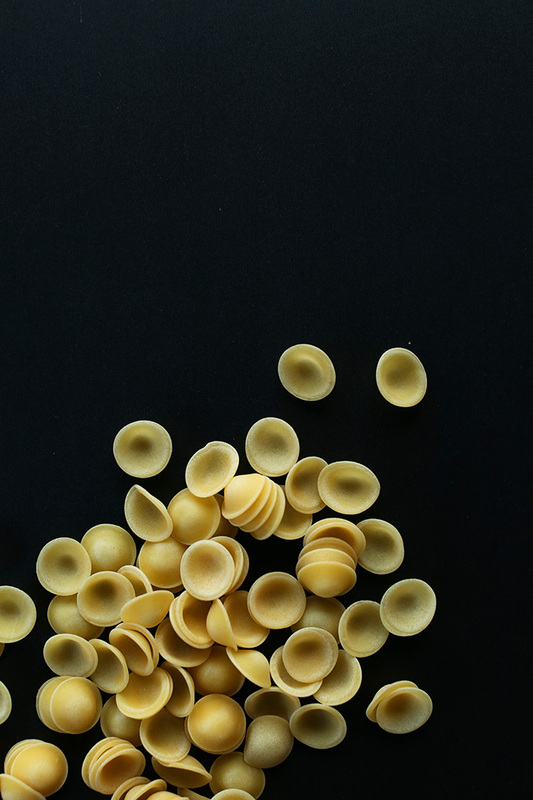 The pasta shells look like mini-farmers hats, as if a hundred mini farmers threw their straw hats in the air like it was farmer graduation day. I assure you this imagery comes to me not because of “pot”. I have a naturally active imagination. love this idea and all the veggies! Ugh, consider me head-over-heels flattered. Thanks Molly! Let me know what you think of this recipe! I love the idea of cooking the pasta right in a combo of sauce and water – it must infuse everything with a TON of flavor!! It’s not even 8am here, but I could go for a bowl of that business. Brie, it does yield a lot of flavor but my favorite part is just that it’s so simple – one pot, less mess. Hope you enjoy this recipe! Lovely idea and sooo easy – love that it’s one pot (hate washing dishes!) I live in Greece where eggplant is a very commonly used veggie, so I’ll give this a go when I get back there soon. I’ll top mine with cheese for sure. Topping it with cheese will make it “not vegan”. Unless it’s vegan cheese, e.g., Parma. Yes! Just take a look at the cheeses section in fullofplants.com. I don’t have a favorite brand, I usually buy whatever is on sale. That’s usually a brand – like Ragu – that has a no sugar added variety, since some brands can add a ton of sugar to the sauce and it makes your pasta more like dessert than dinner. Hope that helps! That’s how I feel about jar marinara sauce, too much sugar. I use Lawrys or McCormick’s spaghetti sauce mixes because they aren’t sweet. I would love to make my own sauce. I love one pot dishes! this looks amazing! I looooove this! Brilliant. I am so making this for dinner! this is just what i need..thanks Dana. This looks so delicious! Such a fabulous recipe! This one pot business is blowing my MIND! Ok dinner tonight is donezo! Thanks Abby! Let me know how it goes! so many delicious things in ONE pot! YUM!! i can’t wait to try this out soon. it’s perfect for a healthy dish after a busy day. Thank you, Dana for the lovely mention! I’m so honored that my dish was inspirational! And what a beautiful masterpiece, orecchiette is one of my favorite pasta to use. Thanks so much for YOUR recipe. It’s stunning! This looks so incredible! One dish and full of vegetables? I’m in. This pasta looks awesome! I can’t wait for summer when we have loads of fresh eggplant from our garden – I’m so going to make this! Thanks Abbie! Jealous of what sounds like a dream garden. We’re city dwellers now (sans patio) but maybe one day we’ll have room to plant! So cool. See? How do I not know things like this? Thanks for sharing! Holy gorgeous. Who knew pasta could be so pretty? And love this recipe.. so so simple!! So gorgeous! I love the photography, and it sounds amazing! I completely agree, the less washing up, the better! Thanks, Averie! You’re the sweetest. Always appreciate your shares.